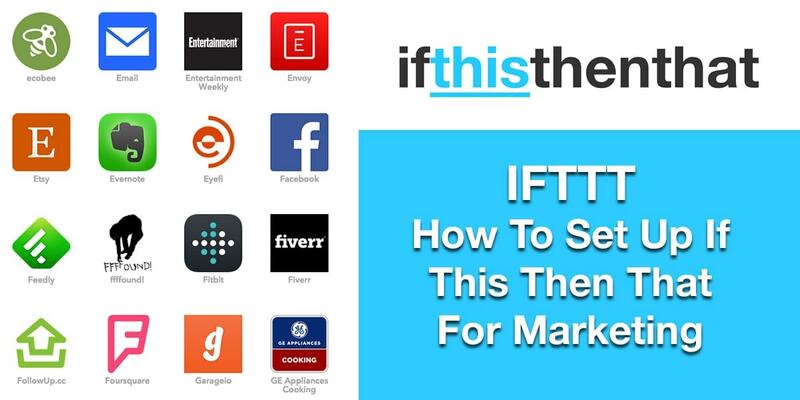 I am a little in love with IFTTT for marketing, If This Then That! I resisted doing it for YEARS (seriously for at least 18 months it has been on my “check this out” to do wish list), but I thought it would take too long and be too confusing so I just stuck my head in the sand and ignored it, moving the to do from month to month. Then I got even busier doing fun stuff for my business and starting new product lines that are AMAZING and I got sick of wasting my time posting to social media whenever I did a new product or wrote a new blog post. AND I thought it would be neat to see what other kinds of things it could do too! When you first log in, it can seem intimidating to say the least. I am a kind of internet-y girl and just having that big open space with no idea what to do fritzed me out for the first year and half or so. But don’t let that happen to you! So there were 178 of these which was really A LOT, but just take a deep breath and figure out what you are actually trying to accomplish. Instagram will NOT post to my business page, just to my personal account so I want some of my pictures to go to my business page. 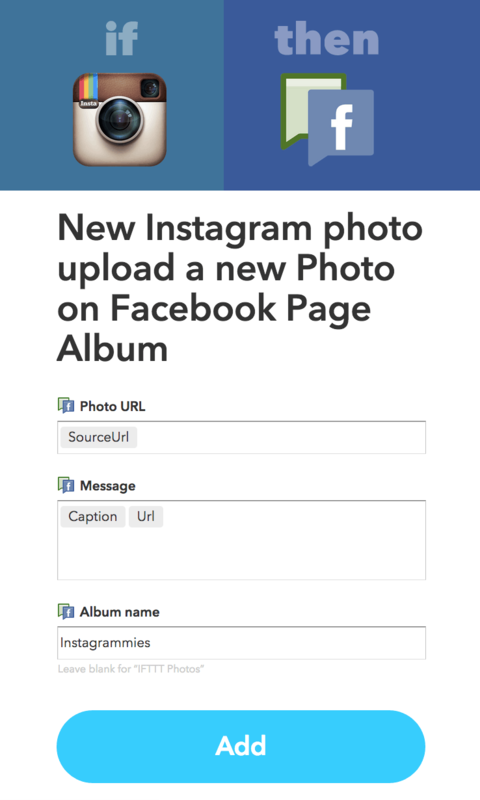 That recipe, “New Instagram photo upload a new Photo on Facebook Page Album” will fit the bill. AND bonus, 9.8 thousand other people are using this so it will probably work! And SCORE! 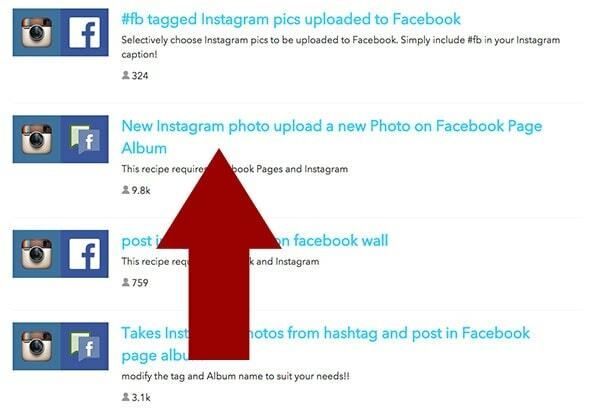 It is a simple recipe that just takes all my Instagram photos and puts them on my Facebook page. Some of the recipes are very complex, requiring hashtags and working, for this very beginning time, I just want to do something easy so this is perfect for me! As I was getting this set up I had some questions going through. Here are the ones that came to mind for me as I was getting started. I did this by having “channels” of logins. For example, I have my Tara and Marketing Artfully recipes all on my marketing artfully login. All my necklaces are with my Paperly People account, etc. So far I have 3 sets of recipes and logins. 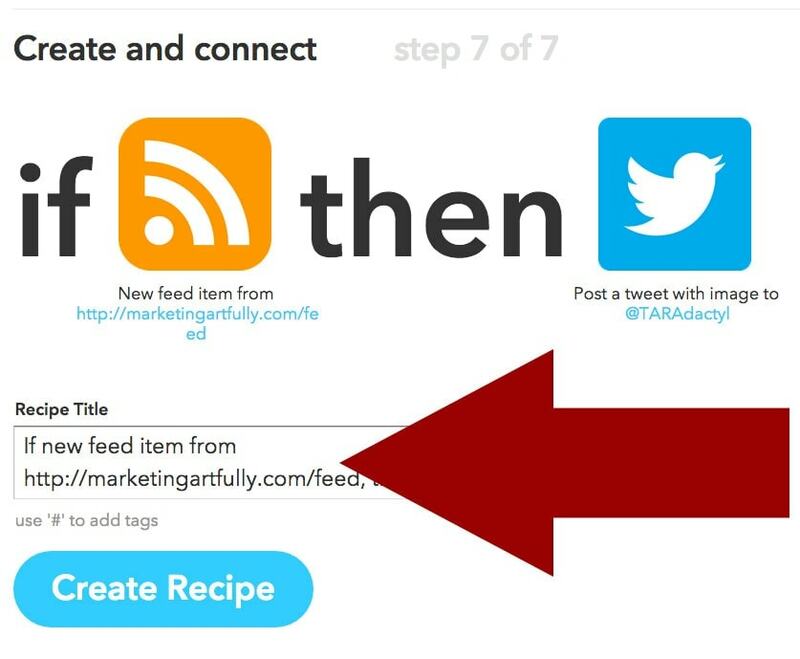 Sometimes I hate that all my Facebook pages are hooked to my personal account, but this does make it super easy on IFTTT! So now I know that the top recipe makes my blog posts from PaperlyPeople.com go to my Paperly People Facebook page! It is much easier to tell at a glance than if it just says that some RSS feed goes to some Facebook Page. Once you have a lot of recipes running, it can be hard to remember what is going where. I also wanted to make sure that the recipes worked so I have been checking them as I go. 5. You will need a baby checklist to remember the few places you still have to post. The other day I was doing a blog post and thought, “hmmm I better hand post this to Pinterest and Google Plus” (IFTTT doesn’t work on google plus). Then a little bit later I went back in and realized I had double posted on Pinterest because I had set up IFTTT to do it for me. Sigh. I am sometimes too efficient for my own good! With that in mind I made a little cheat sheet to tell myself what I still had to do personally (like post to G+) and stuck it to the side of my computer monitor. When I started I saw all these RSS feeds and thought, brilliant, I will use one of those. Not so fast there partner. You need to make your own recipe because no one will have made YOUR blog’s feed yet probably. Then pick the New Feed Item (the other one is fancy, you might want to use it, but honestly I just want to keep this as simple as possible! The neat thing is that you can search for your channel…I wanted Twitter! And then I picked to post a Tweet with an image. 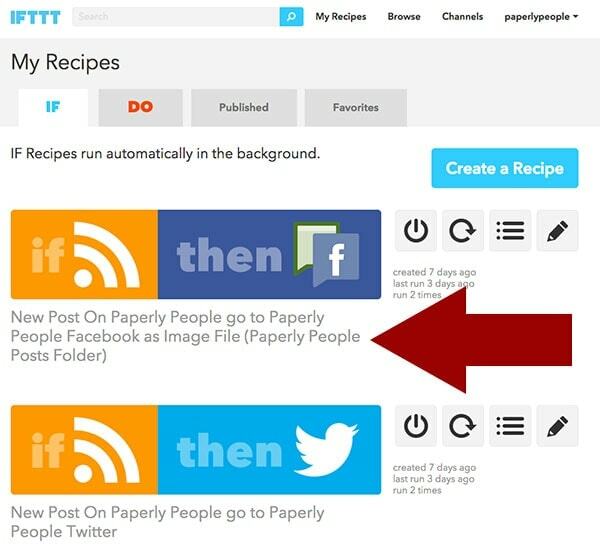 The IFTTT recipes are actually what makes this work. 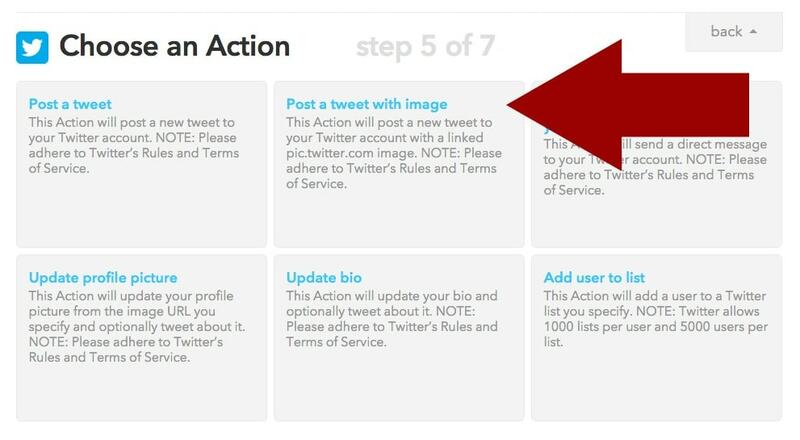 Instead of just a lame little link with no picture, you can make sure that you are presenting EXACTLY what you want to post! And finally, make the recipe, make sure to change the name to something you can remember and then add it to your spreadsheet! 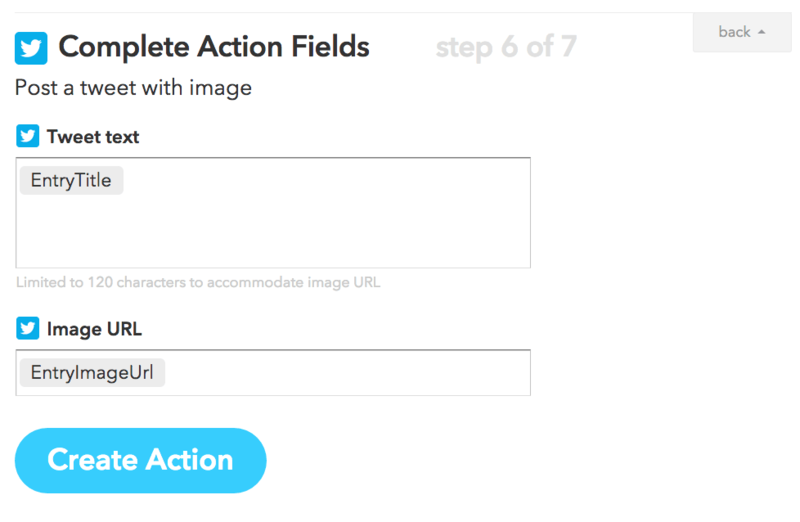 Well hopefully this will help you to be less of a wimpy than I was and get your IFTTT set up and running soon to save yourself some time! Honestly, figuring out how to automate pieces of your business the RIGHT way will buy you time and keep you from tearing you hair out. Take a couple of hours today and save yourself hundreds of hours later! Previous Post: « How Many Items Should You Have In Your Etsy Store?